Naples, Fla. (June 16, 2017) – Record-breaking rain fall in June did not dampen buyer interest in the Naples housing market as evidenced in the Second Quarter and June 2017 Market Reports released by the Naples Area Board of REALTORS® (NABOR®), which track home listings and sales within Collier County (excluding Marco Island). 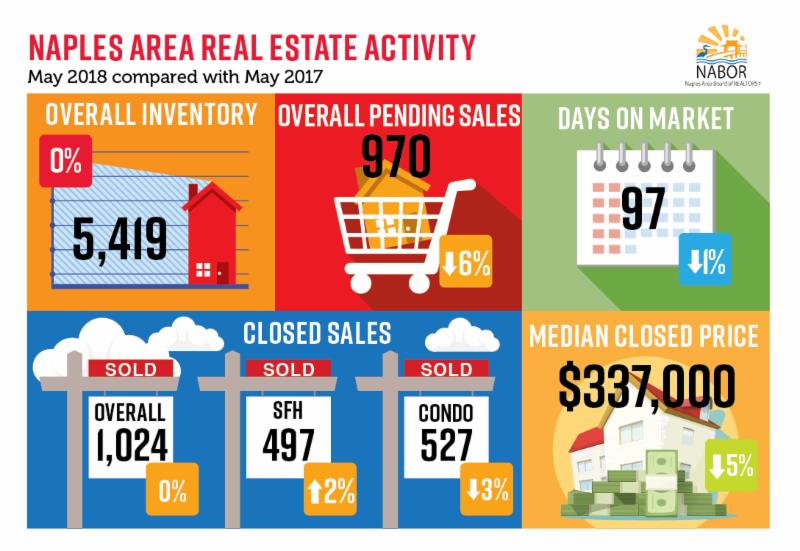 The 2Q report showed strong and steady sales activity leading into summer with a 7 percent increase in overall closed sales to 2,880 closed sales in 2Q 2017 from 2,704 closed sales in 2Q 2016, and a 9 percent increase in overall closed sales for the month of June to 907 closed sales from 832 closed sales in June 2016. The new year rebounded with a strong gust of activity in the Collier County real estate market. Increases in overall pending sales (homes under contract), overall closed sales and overall inventory indicate a strong season ahead. Broker analysts who reviewed the January 2017 Market Report, which tracks home listings and sales within Collier County (excluding Marco Island) using the Southwest Florida MLS, are confident that market indicators are favorable to support momentum through season. According to the January Market Report, overall pending sales increased 9 percent to 924 pending sales in January 2017 from 847 pending sales in January 2016. Broker analysts said they are most encouraged by pending sales activity in the middle range of the market; namely, homes between $300,000 and $2 million, which all experienced double digit increases in January. Overall closed sales increased 6 percent to 603 closed sales in January 2017 from 571 closed sales in January 2016. Interestingly, January was the first time both overall pending sales and overall closed sales were on the upswing simultaneously since March 2015. The report also showed that overall inventory for all price segments increased by double digits in January too. Comparatively, condominium inventory in the $2 million and above category had the highest gain with a 44 percent increase to 135 condominiums in January 2017 from 94 condominiums in January 2016. Zorn added that geographic proximity to the beach remains a driving force in the Naples real estate market. As such, properties located in the Naples Beach area experienced a 15 percent increase in overall median closed price to $784,000 in January 2017 from $680,000 in January 2016. Pending sales for the Naples Beach condo market for January 2017 increased by almost 40 percent compared to last year and closings were up 16 percent. This was mostly driven by a somewhat limited condominium market in the Naples Beach area, where inventory increased 34 percent and pending sales shot up 39 percent in January. “Today, buyers have more choices,” Zorn said. Many broker analysts including Zorn, Vellano, and Wes Kunkle, President and Managing Broker at Kunkle International Realty, said they have observed a large increase in investor held single-family homes being added to the inventory mix in recent weeks. Zorn pointed to signs of bracket creep in the report, such as a 23 percent increase in inventory for single family homes in the $300,000 to $500,000 price category, while its median closed price fell 4 percent. Jones also cited that days on market for single-family homes in the $500,000 to $1 million price category had doubled in January, while this price category’s median closed price actually rose 4 percent. Zorn agreed and added that the cost of holding out for a higher price in many cases – especially for investors – could result in a loss of revenue from both rental income and unavoidable costs like taxes and insurance. Reflecting a lack of suitable global alternatives and a proven track record of steady returns generated by US real estate, the latest annual survey of overseas investors by the Association of Foreign Investors in Real Estate (AFIRE) confirmed once again that the United States remains by far the world’s most popular destination for foreign real estate capital. In addition to securing its status as the leading U.S. city for foreign capital for a seventh consecutive year, New York City ranked as the world’s top city for foreign capital for the third year in a row. Los Angeles again ranked #2 among U.S. cities for the second straight year, followed by Boston, Seattle and San Francisco. Also notable was the falling stature of Washington DC. For the first time since the survey’s inception in 1992, Washington, DC dropped out of the top 5 U.S. cities as a preferred global destination for foreign commercial real estate investment, coming in at #6 after ranking #4 in the late 2015 survey. DC alos fell to #15 globally after rising to eighth place in the previous survey. DC ranked as the top destination for global capital among the world’s cities several times during the early 2000s, but has not been ranked among the top five global cities in terms of investment attractiveness. It has ranked no higher than #8 since 2013, following an extended period of budget disputes and lower federal spending. Despite the shift in ranking, Catherine Pfeiffenberger, AFIRE chairman and senior vice president of Skanska USA Commercial Development, noted that the District’s stable fundamentals will continue to attract capital from around the world, adding that the incoming Trump administration’s expected increased spending on defense and aerospace may also benefit the market’s muted leasing activity over the past several years.